Our Waystation program grew substantially in 2016, allowing St. Hubert's Animal Welfare Center to meet and work with so many dedicated animal welfare individuals and organizations throughout New Jersey and the United States, all with the shared goals of trying to save lives and find more homes for adoptable pets. And together we did save lives, we welcomed over 6000 animals in our care in 2016. This is just the beginning, St. Hubert’s continues to connect with regional shelters and share best practices while planning how to expand on our life saving work today, tomorrow and for the future of animal welfare. What makes St. Hubert's Transport/Waystation so unique is our partnerships represent a relationship beyond the simple transfer of animals and includes opportunities for information sharing, and the distribution of funds to support spaying and neutering of public or free roaming animals in the source community. St. Hubert’s is changing the way shelters interact with each other and promoting teamwork. We believe in promoting best practices, and educational resources in order to enhance our joint efforts and heighten the sense of community goodwill within the animal sheltering profession, while helping more and more animals. Each Source Partner Shelter, which is the shelter we receive the adoptable pet, is given $25.00 per animal by participating in the program. 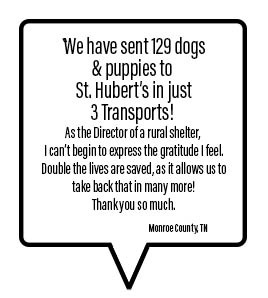 For many small rural shelters, the benefits of participating in the St. Hubert's program is multi-faceted, the funds are directly used to increase spaying and neutering of community pets, while allowing the adoptable pets at the shelter to quickly move to another part of the country where there is a greater chance for them to find homes. Many of the smaller shelters have limited resources, so to contemplate funding a needed community spay and neuter program is beyond the realm of possibilities.As an example, one of our regional sister shelter source partners exists on an annual budget of $26,000. By working together, things become possible. The Sister Shelter staff also benefits through shared resources and educational opportunities, which helps to increase employee morale and management efficiency. At times, it is often enough for the Shelter Staff to be able to speak to other Animal Welfare Professionals and know they are not alone in their work and dedication to saving animals. St. Hubert's also works very closely with numerous destination partner Shelters. These partners are at the other end of the process and receive just as much attention from our St. Hubert's team in making sure they have room for adoptable animals and adhere to the Waystation program quality standards. St. Hubert’s takes its role as guardian to these transported animals very seriously. Animals are altered and evaluated before they go out to be adopted. The program impact goes far beyond saving lives. Here are some quotes from our Sister shelters and Destination shelters. St. Hubert's is redefining how an animal welfare organization functions and give back- not only do the animals win, but so does the animal shelter community. The positive ripple effect is contagious. Look for more information and developments as 2017 progresses! 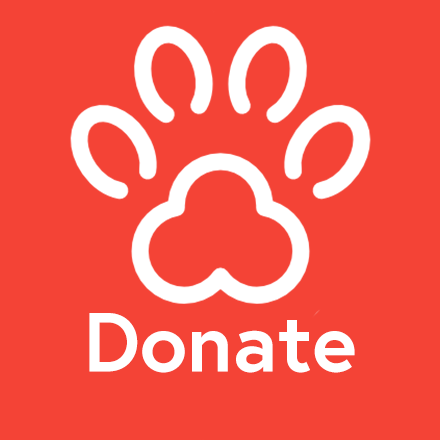 Anderson County PAWS is so happy to report that due to your giveback program we have been able to implement a “Spay or Pay” program for dogs. So far we have altered 23 dogs! We can’t thank St. Hubert’s enough for being a partner and helping us give back to the animals in our community!